Beech 18 Sea Wind is no more ! The Sea Wind, officially known as the Beech 18 EHG (extra high gross), performed well for more than a dozen years. But on that afternoon, C-GVIB crashed and sank on takeoff from Jackson Bay, a logging camp in Topaze Harbour about 60 km north of its home base of Campbell River, British Columbia. With the company’s chief pilot at the controls, one of the engines failed just after takeoff. The floatplane banked sharply and then hit the water. Although the aircraft sank within 45 seconds, the pilot and six passengers managed to hold onto the broken pieces of pontoon, which were also taking on water and going down. The survivors, who were all wearing life jackets were in the cold water for about 30 minutes. They were rescued by a Buffalo search and rescue aircraft and a Cormorant helicopter, both from 442 Sqn. at Comox and Campbell River’s fast-response Coast Guard vessel Point Race. The accident was Vancouver Island Air’s first incident in 22 years involving passengers. One of the survivors noted, “if it wasn’t for the pontoons, we wouldn’t have made it… it was damn cold.” The sunken aircraft is not showing signs of leaking gas or oil, but it is unlikely that it will be salvaged. Beech C-GVIB ex N483B c/n A-480; converted by VIA to Seawind. "In the summer of 1981, the aircraft was seized at Palm Beach,FL for illegally importing some 1,990 lbs. of marijuana. single tail Westwind float plane. Aircraft was lost (sunk and not salvaged) in April 2007, after one engine failed after take-off. The first Beech Model 18A, which made its first flight from Witchita, Kans. on January 1937 had underpowered 320 hp Wright R760 engines. Model 18S, introduced in January 1939 came with two 450 hp P&W R985s, which was quite an improvement. By 1969, when model 18 production ceased, over 7,000 of these aircraft had rolled of the assembly lines. After World War II, a large number of Beech 18s came on the civilian market. Many of these Beech 'Expeditors' disposed of by the Royal Canadian Air Force were converted to civilian D18S standards. Following a string of accidents, the aircraft gained a tarnished reputation of being a "flying rat trap". Between 1980 and 1991 alone, at least 35 Beech 18s have crashed in Canada. However, operators and pilots flying the Beech 18 strongly disagree with this negative reputation. The aircraft’s age should not affect its safety and reliability, if it is properly looked after. Engineers, maintaining these old birds agree. "It doesn’t matter how old the aircraft is; it’s reliability that counts. Just religiously do your thorough daily inspections and you’ll stay ahead of trouble. Check whether the float fittings are smoking, (those tell-tale dark streaks of wearing metal dust) and visually check those cylinder hold-downs each day, and your Beech will go forever." Canada’s first Beech 18 on floats was operated by Starratt Airways of Hudson, Ont., between 1937 and 1941. 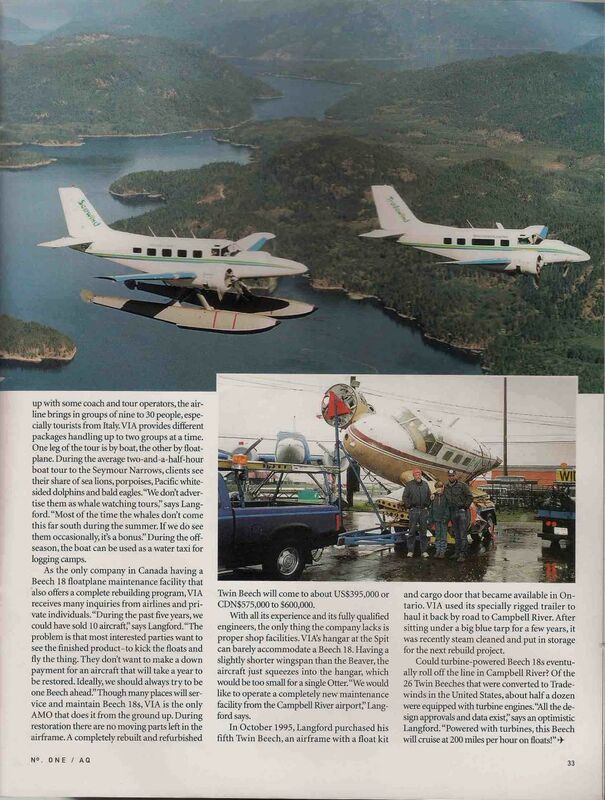 Though some 85 Beech 18s converted to floats were operating in Canada the early 1990s, only two of these were plying the B.C. coast. Early in 1992, one of these crashed in Nanaimo’s Departure Bay, killing seven. Opinions about the cause were divided. 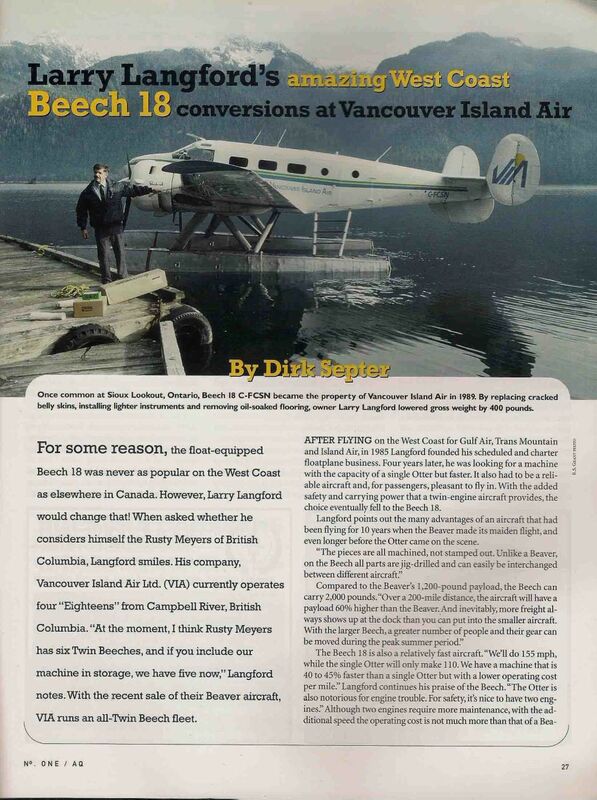 "The Beech 18 can be adapted to floats, but was never made to be a bush plane,” remarked a retired floatplane pilot. “It was built to land on wheels on a runway. Heavy metal pontoons add a lot of weight". A vintage aircraft photographer who knew that particular aircraft well, said that the Beech 18s are prone to spar failure. "They need metal reinforcement straps attached to the underside of the wing, which the aircraft in question did not have". Although the 'Eighteen' was never as popular on the West Coast as elsewhere in Canada, Larry Langford would change that! 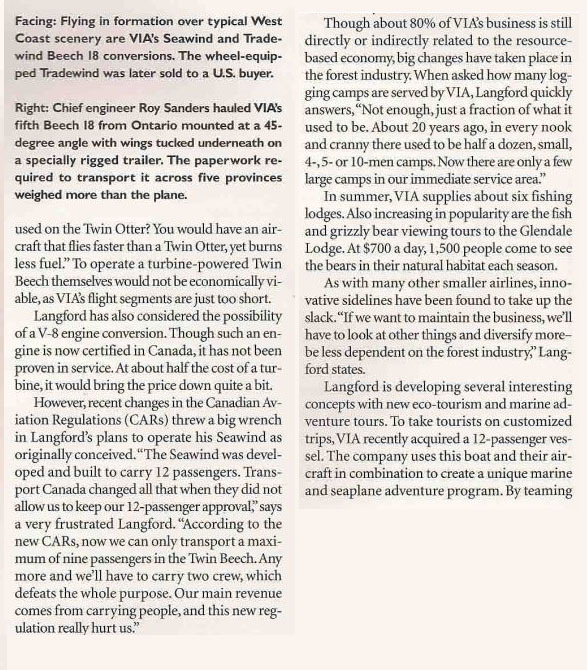 Langford operates Vancouver Island Air (VIA), a scheduled and charter floatplane operation out of Campbell River, B.C. He founded the airline in 1985, after flying on the West Coast for Gulf Air, Trans Mountain and Island Air. Four years later, Langford was looking for a machine with the capacity of a single Otter but faster. It also had to be a reliable aircraft and from a passenger point of view pleasant to fly in. With the added safety and carrying power a twin engine aircraft provides, the choice eventually fell on the Beech 18. Upon closer inspection, however, the machine did not look all that bad and likely could be put to work without too many repairs. So it was decided to purchase the Beech and make arrangements to ferry it out west when the ice would leave the lake. Upon the aircraft’s arrival at VIA’s base at Campbell River, Nilson went to work on the Beech. Repairs during the seven-month refit included fixing anything that might give trouble in the next 1,000 hours. Also, everything that was not absolutely required on a VFR single pilot aircraft was removed. Whatever could not be removed was replaced with something lighter. Nilson applied to old proven method of "if you throw it up in the air and it comes down again, try to leave it out". The pile built up on the hangar floor of all the stuff that came out of the aircraft steadily grew. There was the oil-soaked plywood flooring, undercarriage relays and fittings, naugahyde upholstery, tail wheel retraction parts, radio racks and wiring dating from the late 1950s. Nilson later regreted that they did not weigh all that junk. Some of the other treatment included a two-piece windscreen and flush riveting. After putting it all together again, the weight of the completely overhauled aircraft was reduced by some 400 pounds to a mere 6,200 pounds. The cruising speed of the Beech 18 seaplane was increased by about 15 knots to 140 knots. Operational the aircraft could now carry a 2,200-pound payload. Between December 1994 and August ‘CSN went through another rebuilt at Nilson’s Aircraft. As the machine was making money, a second one, registered as C-GVIB, was purchased in 1991. Though this 'Eighteen' had relatively low time on its airframe, it had led an interesting life. At one time, the aircraft had even been seized as a drug runner in Florida. Subsequently it was sold by the sheriff’s office. The aircraft’s last owner in the lower 48 was a skydiving club in California. Langford had developed an idea to turn this Beech 18 into an aircraft with a basic weight of 6,200 pounds and an all-up weight of 9,300. This compared to a standard Beech on wheels which weighs 6,400 pounds empty and has an 8,725 all-up. It would cruise at 170 mph and carry 2,500 pounds or 12 passengers, burning about 285 pounds of fuel per hour. Langford foresaw the higher speed and increased load capability of the redesigned aircraft as prime considerations for airlines planning to upgrade their fleet performance. 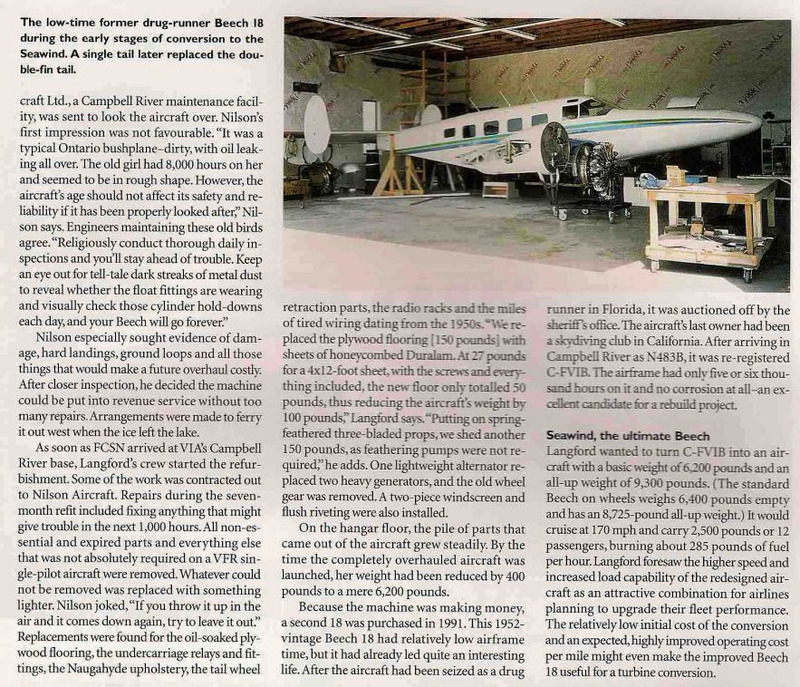 The relatively low initial cost of this conversion and an expected highly improved operating cost per mile, might even make the new improved Beech 18 a valid candidate to turbine conversions. 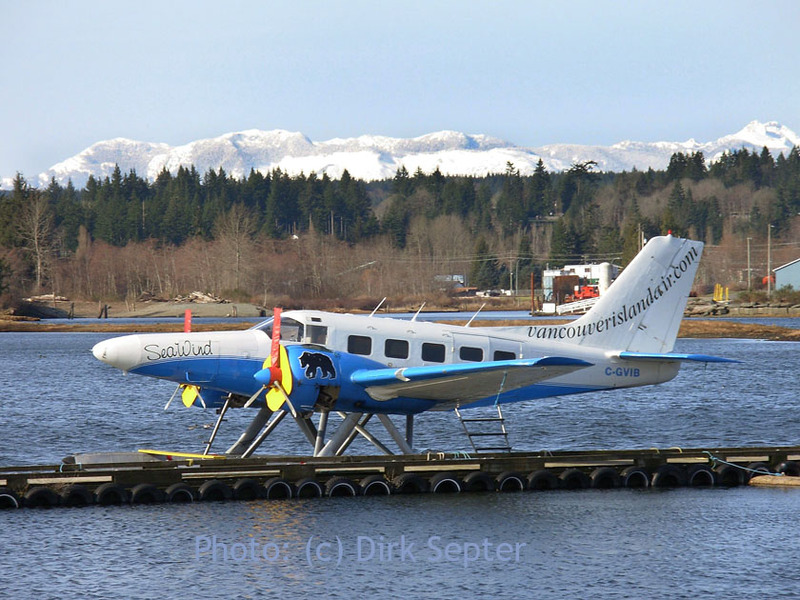 The conversion project was undertaken by Nilson Aircraft and Vancouver Island Air as a joint venture. Nilson’s shop would perform all the redesign and structuring of the aircraft would fly it and eventually market the new creation known as the Beech 18 EHG (extra high gross). Nilson chopped off the relatively blunt Beech 18 nose and replaced it with a Hamilton extended nose with a 67-gallon auxiliary gas tank and room for 330 pounds of freight. Besides allowing for extra baggage and fuel tankage, the singularly long tapering nose also improves the airflow over the wing. In fact, the nose was so long that the job could not be completed in VIA’s, there was just not enough space! It was decided to move the aircraft to a larger hangar at the Fresh Water Marina further up river. However, the question was how to get it there. Initially the Beech had arrived at the Campbell River airport on wheels. 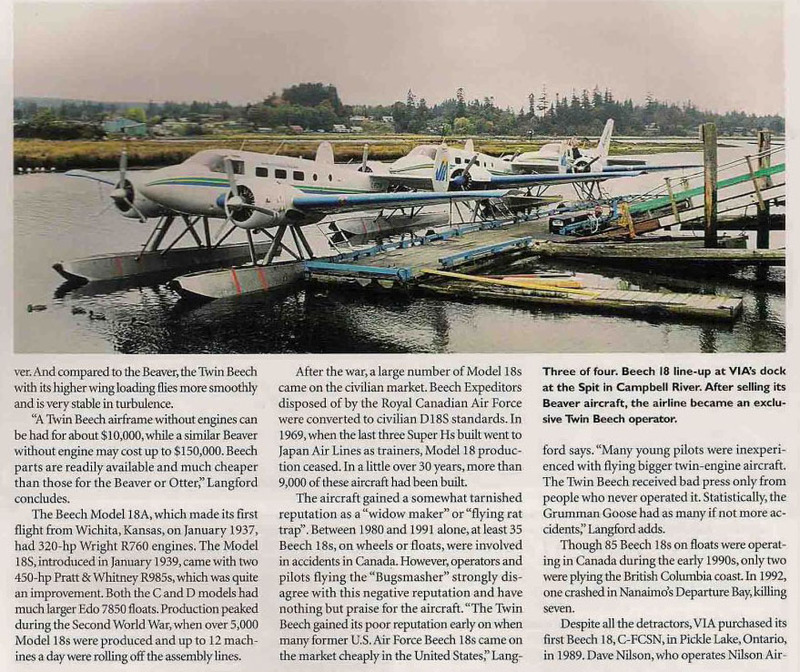 The disassembled Beech was towed on its own wheels to VIA’s hangar at the Spit, where all Campbell River’s floatplane operators are based. As the wheels had since been removed and sold, it was now sitting on a set of jury-rigged legs for moving it around. Finally, after looking at different options, using Marine Link’s big self-powered barge that operates out of Campbell River would be the best solution. Out came the measuring tapes, and lo and behold, the aircraft did just fit onto the loading ramp! But now how to get this clumsy thing onto the end of the barge? After some more measuring the final solution was simple. The airframe was put onto the powered “Super cart” beaching gear and driven onto the barge. Midday at a low tide, it all happened and the whole thing happened like clockwork. Dave Nilson had worried about this for a week and the move was all over in less than 30 minutes! Work continued on the aircraft in what Nilson called 'Hangar Number Two', but which soon became known as 'the Beech House'. The aircraft’s very impressive nose was installed and its floor completed. Some 150 pounds of plywood floor were replaced with 38 pounds of honeycomb composite. The wiring and control cables were put in followed by the roof hatch. After the freshly painted wings, stabilizer and vertical fins were put on, the aircraft slowly took shape. Next were the cowlings and the instrument panel. In order to permit the extra load carrying and increased displacement, the Bristol 7850 floats were extended with 33.5 inches (a 13.5-inch section just forward of the front strut and 20 inches in the aft section) to become 8500s. Some problems were encountered finding enough material and some of the parts for the floats which were also modified with freight lockers. Computations to end up with the desired centre of gravity (C of G) range and how much fin area would be required were an even bigger challenge. By adding floatation to the pontoons, altering the existing relationship between the C of G and the floatstep and planing area had to be avoided. Dave Nilson Jr. who with a crew of technicians worked on the aircraft’s metamorphosis, was a bit worried about this relationship between the C of G and the float planing area. In order to control the C of G better, the fuel tank and baggage compartment had been put in the aircraft’s long nose. This now would probably necessitate increasing the fin area on the tail for better flight stability and directional control. Actually it would be nice to get rid of the existing fin all together. Being constructed of steel tubing with fabric covering, dunking it in salt water with every take off, was not an ideal situation. Despite all the headaches, calculations and recalculations the whole project was quite a learning experience for the crew. But at the end everything worked out. 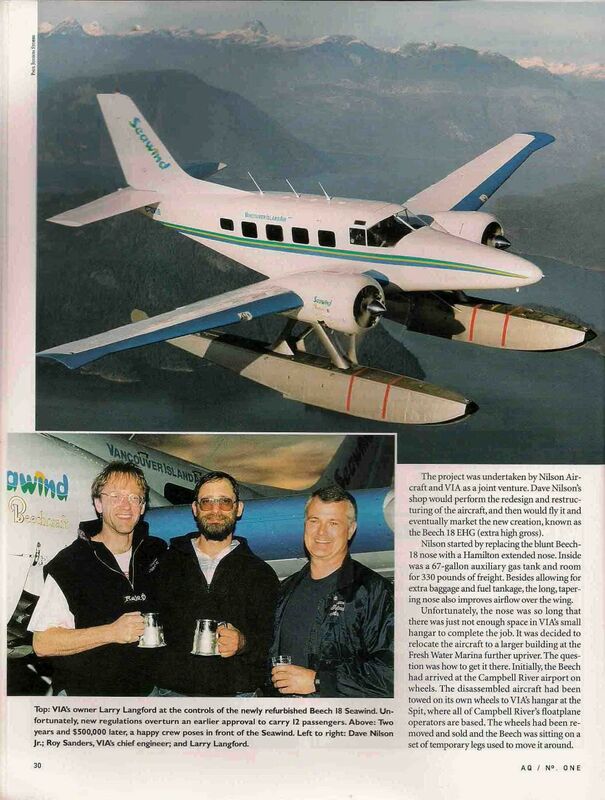 Two years and some $500,000 later in September 1993, ‘VIB was ready for its first flight as the Sea Wind as Langford had christened a newly redesigned aircraft. The old 1930s-vintage aircraft had been successfully converted into a more efficient, higher performance seaplane providing safety and customer appeal, while getting the most seat-miles per hour for the best possible operating cost and all this at the lowest capital cost. But Nilson started thinking how the new Sea Wind could be even improved more. Do we really need two drag producing fin and rudder units where one big one would be much more efficient? After a number of test flights the Sea Wind went back into Nilson’s shop. After taking care of the front of the plane, Nilson now went for the tail end of the aircraft. Off came the double-fin tail to be replaced by a new single-fin tail, similar to the one on some Westwinds. Still not completely happy with the results, Nilson was looking ahead and wonders out loud, "Can we squeeze a bit more airspeed out of it by cleaning up the airframe even more. What if we streamline the floats and attachment gear better, get rid of that aerodynamically outrageous spar strap and design a retractable cabin ladder? What about a modern cockpit with digital engine instruments? Would it be possible to install a radial two-stroke diesel engine with a better power to weight ratio or maybe a PT6A-27 engine as used on the Twin Otter... Then put the whole thing on Wipline 1300 floats, and you would have an aircraft that flies faster than a Twin Otter, yet burns less fuel". 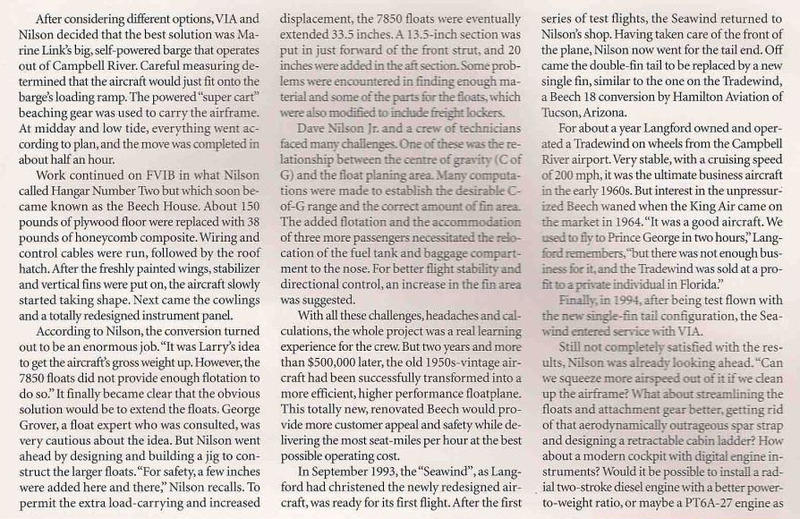 "For history and conversion details see this article which I wrote for Aviation Quarterly's Spring 2002 edition."